The Three-Nine-Four apartment and senior housing complex in Golden Valley got a thumbs-up from the city’s Housing and Redevelopment Authority this week, moving the project closer to its expected fall groundbreaking. The project has changed scope and layout since it was first approved by the Golden Valley HRA in April. The senior building changed from a five-story, 149-unit building to a six-story, 120-unit building. The market-rate apartments are still six stories, but the number of units has increased from 212 to 314. The site plan also changed in response to some concerns from the neighborhood. The Three-Nine-Four development team, including Global One Commercial and Denver-based Forum Real Estate Group, now has to complete its purchase of a portion of the site from the Minnesota Department of Transportation, said Mark Grimes, Golden Valley’s economic development director. The developers are expected to return to the City Council in later June or July. 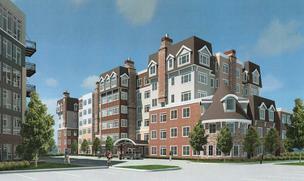 Tushie Montgomery Architects designed the buildings and Greiner Construction is expected to be the contractor.